Trueglitter: It is said “desperate situation requires desperate measures” which is why the much-embattled former prime minister, Najib Abdul Razak, is pretending to be utterly incoherent and intelligently-challenged with his meaningless rhetoric in face of mounting evidence uncovered by PDRM (Royal Malaysian Police) at various residences linked to his family. The silent majority are understandably perplexed and in great disbelief that the unperturbed Najib should be stoically denying any personal wrongdoings connected to accusations of his involvement in corruption and abuse of power. Amidst the overwhelming euphoria that the nation and its citizens are now basking in at the change of government, it would, however, be prudent and a necessity for all Malaysians to exercise the required restraint. That means not to be vindictive towards the fallen politicians, particularly Najib, and to allow the law to take its natural course. Anonymous_1fcb07f5: Najib, presumably the US Department of Justice (DOJ) is slandering you, the Swiss authorities and Singapore Monetary authority are also slandering you; plus, practically the whole of Malaysia (except your lackeys and supporters) are slandering you. That's quite a lot of people slandering you. Unfortunately for you, the truth is out. Please have the decency not to lie to your constituents in Pekan. New Hope: Who will admit they are wrong? That is why there are courts to examine the evidence and determine the truth. When the courts declare that Najib did not steal, then he will be vindicated though I very much doubt it in the light at the amount of gold, jewels, money and handbags worth millions found in his properties. On his salary, there is no way he can earn a fraction of what has been discovered. So, the courts will determine whether he is a thief. Cogito Ergo Sum: You can fool some of the people all the time. Obviously, you have been fooling the people of Pekan for 41 years with ‘dedak’ (animal feed) and blocking important information from reaching them. But all this will end when evidence of your alleged greed will be exposed and dissected by the prosecution. And I am sure your lawyers will try to keep postponing the matter for as long as possible. But the matter is urgent and a certificate of urgency must be filed by the prosecution. It is of great public interest to see how their monies have been frittered away by an alleged kleptomaniac. It will be interesting to see how you answer and rebut the questions put to you by the prosecutors. 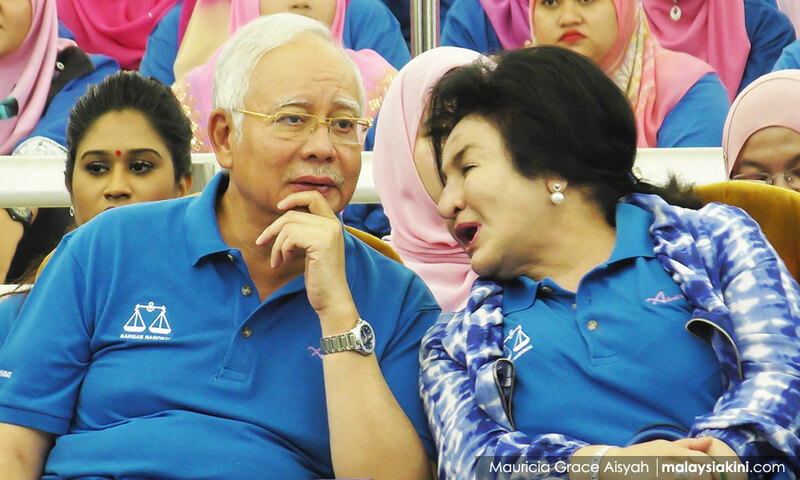 Susahkes: Dear ex-PM, you once said that you treasure loyalty above brains, but I got to admit, I didn't realise you also apply that yardstick to your own self. You should tape yourself and listen to your own conversation if only to know how ridiculous you sound. For the life of me, I cannot fathom how you managed to stay on as PM since 2009, for there is no explanation for the levels of ridiculousness that you have lowered yourself to.